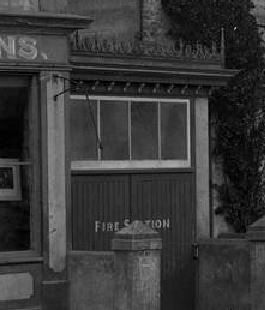 The image on the left shows the diminutive fire station, one time home to the Wroxall Parish Council Fire Brigade that existed from 1901 to 1928. The history of firefighting on the Isle of Wight could easily be swamped by the big six born in the Victorian era, plus those of East Cowes, Bembridge, Freshwater and Yarmouth that emerged between 1900 and the 1920's; all of which still maintain an active fire station. This sole image of Wroxall's station, extracted from the corner of a much larger photograph showing what is now known as the B3327 running through the heart of the village, represents how little is known of the several other brigades that at one time or another, existed to protect specific areas or works on this Island. Northwood, Newchurch and Binstead once had their own brigades, so too did the Osborne Estate and several works brigades protected Saunders-Roe, J.Samuel White's and Groves and Guttridge and many more through the decades of the twentieth century. Before the First World War St Helen's Urban District Council were compelled, after the great fire at Appley Towers of March 1904, to do something positive about fire protection. Under a plan devised by retired Captain George Harrison of Thornton who formerly commanded the Kingston and Surbiton Fire Brigade, the district that covered a broad area, was divided in to three sub-districts for fire protection purposes, each had its own fire brigade; St Helen's Fire Brigade, Seaview Fire Brigade and St John's Fire Brigade. Lea Airport (Sandown Airport) possessed an emergency response capability as far back as the 1930's and this was maintained and enhanced under Civil Aviation Authority regulations up until 2007. Britten-Norman's fire and rescue service (of which the writer was once firefighter and later senior officer) operated to a high degree to both Civil and Ministry of Defence standards and even established an impressive fire station on the eastern boundary of Bembridge Airport until operations were relocated to the mainland in 2012. All of these peripheral brigades played their part in the history of Island firefighting but have proved by far the hardest to research. If anyone has anything to share with the IWFBF the webmaster would love to hear from you as the federation was always about all firefighters and always shall be.